Do you want to test and develop software better? When you want to improve, you need someone experienced working directly with your teams. I provide hands-on, work based consultancy, to help you take realistic actions and improve your situation. I don't come pre-armed with a 'Head Office Solution', and write a report to sell you more consultancy. I use my experience to work with you quickly, to solve your unique problems and help you make the right decisions. My name is Alan Richardson. How do you want to improve? Hire me to work with you and help you improve. I'm normally around London, but if I'm travelling near you then I might be able to extend my trip and fit you in. Read my travel schedule in more detail here. If you're learning from your mistakes, you're doing it the hard way. Learn from my experience and be up and running quickly. 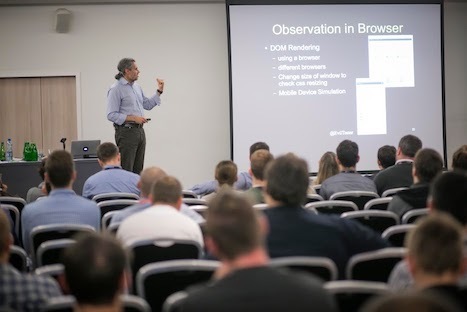 If you've come quite far already, you'll need experience to advance faster or resolve issues e.g intermittent failures, or a hard to maintain code base. You can train with me online rather than waiting for a public training course or conference. The courses have received amazing reviews and you can start learning immediately and continue at your own speed. I deal with any technical queries in the discussion forums of the course. If you would rather learn from reading a book then you're in luck. I have distilled my experience into several books, packed with exercises and examples to help you improve your automation skills and increase your technical flexibility. 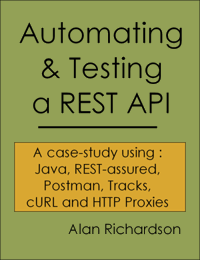 Automated Testing with Selenium RC and Java. I have worked with companies across many different sectors. I specialise in testing, not in a specific industry domain. 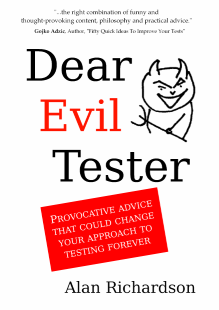 eviltester.com hosts our blog, news content and articles on: testing, technical exploratory testing, automating and programming. You can join the e-mail list to periodically receive up to date information about new products, lessons learned and courses.